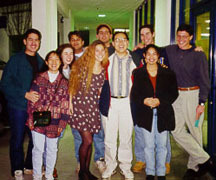 In college, I was Vice-President of the student government (ASUCD). This picture is from a press conference with me, Dave Rosenberg, mayor of Davis, CA (middle), and Peter Nguyen, ASUCD President. We got the Mayor to switch his position on several student-city issues. 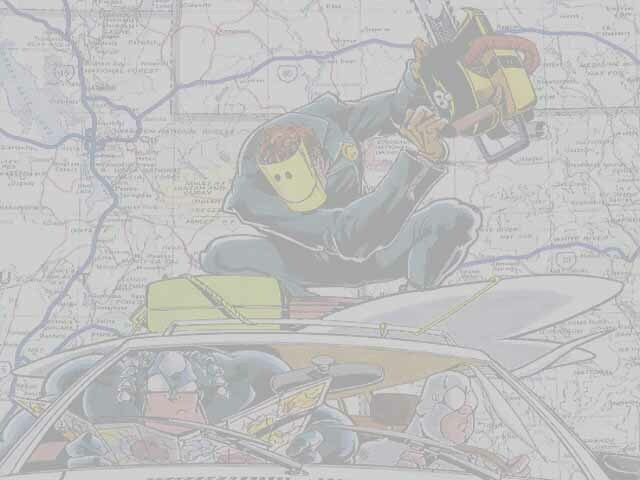 This photo took up almost half of the front page of the California Aggie, the student-run school newspaper. 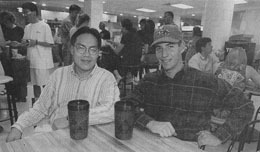 Me and Peter in the ASUCD Coffee House, the busiest restaurant in northern California and one of the forty or so units that comprised our $8.5 million dollar budget. Among ASUCD's other units is Unitrans, the bus service that provides public transportation for the city of Davis and to the Sacramento Airport. This photo appeared in the Davis Enterprise, the city's local paper. This picture is from UC Davis Magazine of me speaking at a press conference related to ASUCD's contribution to the Student First campaign, which was (and perhaps still is) the largest student contribution to student grants and scholarships in the history of the University of California. UC Davis Chancellor Larry Vanderhoof (far left) and Peter laugh as I explain that the $100,000 bill was sent to me personally, with me listed as the responsible party, and that my dog ate the personal check I had written. 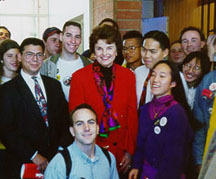 Me, Peter, and other Davis Young Democrats with Dianne Feinstein, U.S. Senator from California. (Left) My college graduation. I received a B.A. in Political Science, Philosophy minor from UC Davis. (Above) The average college kid. left to right: Brett, Dorothy, Lauren, Ashish, Maya, Jason, Peter, Me, Gina, and Amos.